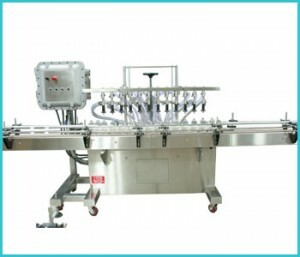 Presser Filling machines provide a versatile method for filling water-thin to medium, constant viscosity liquids into a wide range of containers. Presser filler are operated in gravity mode that is especially suited to highly foaming products, in pressure mode that can fill thicker products. Various models of Pressure Filling machines are available for different applications. As per need of customers, pressure filling machines are customized with the right combination of contact parts and with number of filling heads. Food Industry It is used in Food Industry to fill products up to medium, constant viscosity dressings, soups, sauces etc. Personal Care It is used to fill shampoo, hairspray, gels and mouthwash in Personal Care Industry. Beverages Industry In Beverages Industry Pressure filler are used to fill water, non-carbonated beverages, juice, drinks, spirits, mixes alcoholic drinks etc. Pharmaceutical Industry Pressure Filling Machines are used to fill ointments, cough syrup and rubbing alcohol in pharmaceutical industry. Other Industry Pressure Filling Machines are also used in agricultural and chemical industry. It is also used for Janitorial products such as degreasers and highly foaming cleaners.